Week 75 over at LIM is a color challenge - use GOLD. I used 4 gold elements on my card. The Waltzingmouse Vintage Ornament is heat embossed with gold EP. The gold burst in the oval opening is stamped with VersaColor gold ink. The ribbon is gold, and the gold fronds on the top of the ornament are punched from Creative Memories metallic gold paper. The sentiment is from PTI's Bells & Boughs. The base of the card is embossed with PTI's Linen IP, but the picture does not capture that. This card was really hard to photograph effectively. Well, I now have one Christmas card made. That is one more than last year - lol. Thanks for stopping by today. This is so elegant and beautiful. I can see the linen IP. All your different gold elements really shine. What a gorgeous card, Stephanie. Love that ornament and the beautiful bow on top. Ann Y. 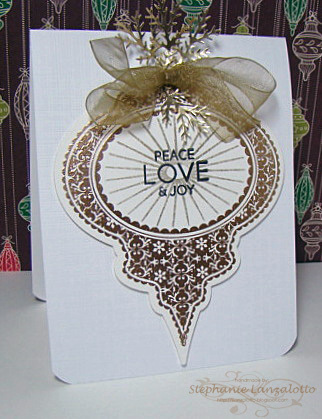 A fabulous ornament, love the linen embossing of the base card, can feel a shopping spree coming on. Simply stunning!! I love the golden "greenery" at the top - a lovely touch!!! I struggle taking pictures with that impression plate also. I've seen it photographed well...but I certainly haven't managed it. I really do see a bit of texture in our photo, but I know what you mean!! It looks like you're well on your way to getting Christmas sorted this year Stephanie with this fabulous submission! This is gorgeous! Such an elegant design and the bow looks stunning! OHHHH! This is a gorgeous Christmas/Holiday card! 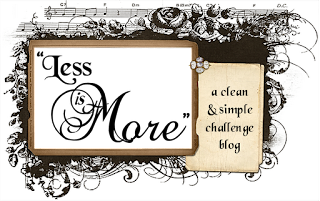 I LOOOOOOVE the bow and the ornament--FAB x10!! !